The book entitled The Twenty-four Paragons of Filial Piety was written by the Chinese scholar Guo Jujing during the Yuan Dynasty. His pen name was Yizi, and he is known in Japan as Kaku Kyokei. The book recounts the self-sacrificing behavior of twenty-four sons and daughters who go to extreme lengths to honor their parents, stepparents, grandparents, and in-laws. Many of the images in this series appear Western in style, rather than Japanese, and were probably copied from Italian prints. 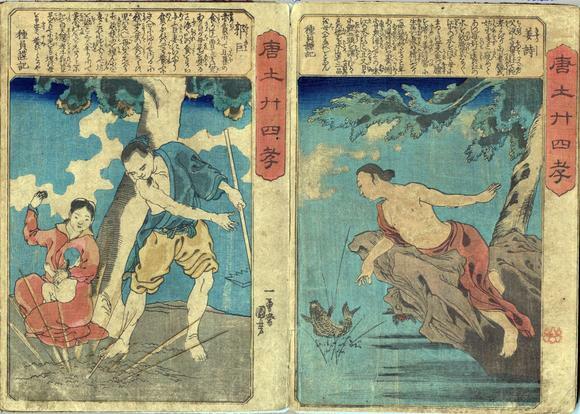 The prints in this edition appear to have been printed two per ōban sheet (about 9.5 x 13.5 inches) and folded to chuban pages (about 9.5 x 6.75 inches). The were once bound together in an album. Kwakkyo, lamenting the fact that his aged mother was going hungry because food was being eaten by his infant son, prepared to kill the baby. While digging the grave he discovered a pot of gold with an attached note (or inscription) that the treasure was meant for him. Kyōshi, along with his wife, traveled great distances to get good water and fresh carp desired by his aged mother. However, one day a fresh spring suddenly bubbled up in their own garden and provided excellent water as well as fish.